The ( current/jan-2013 ) beta status of the first batch of smoothieboards leads to new users having much of the same questions, which are not really answered in the documentation. This is a guide for new users of smoothieboard in general, with specific information about whatever is specific to this first beta batch. As you can see, it lacks most of its connectors. This is so you have the choice to solder whatever connectors is best for your particular setup. This also means you'll have to solder them. The blue screw terminals are 3.5mm pitch screw terminals ( except for the bigger one at the power input, that is 5mm ). Those are extremely common. 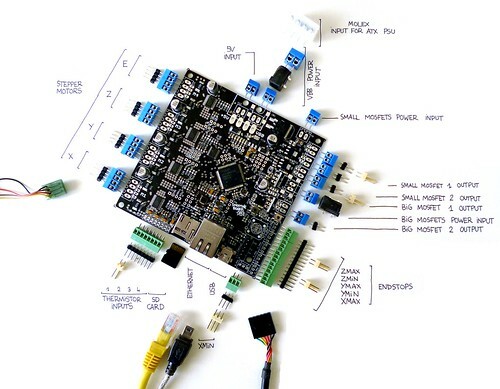 You can find links to buy those connectors on the smoothieboard page, in the "border connectors" section. The cheapest option is simply to use 2.54mm pins for everything ( except power ), but your choice really depends at what is at the end of the wires on your printer : screw terminals are a more "universal" option. Small and big mosfet power select ( see here ). Smoothieboard doesn't come with a microsd card, but it needs one. If you don't already have one, you want to get one ( they are a few bucks on ebay ). If you already have one, you are faced with a choice : the bootloader that was flashed on the beta boards is a bit old, and does not support SDHC cards. Flash a newer bootloader that supports SDHC cards, see flashing-the-bootloader. Or get a 2GB or less microSD card. Now that you have a bootloader installed, you can update the firmware. You very probably want to do this. The firmware you have corresponds to the "master" branch in the github repo. While it works for most things, it's quite old, and the USB stuff will probably give you trouble. It also does not support SDHC cards. The edge branch on the other hand ( https://github.com/arthurwolf/Smoothie/tree/edge ) has all of the latest stuff, including SDHC support, and the new USB stack ( and a whole bunch of added features ). Smoothie gets its configuration from a small file named "config" that you drop in the root of the SD card. You can find information on the page configuring-smoothie. Once you have copied the file under the name "config" on the sd card, you can move on. Seriously. If you are unfortunate enough to be a Windows user, you want to go read this page : windows-drivers to get USB to work on your smoothieboard. If something does not work, you can contact the team via IRC. If you are a Linux or Mac user, don't worry about a thing, it'll all work out of the box. Now Smoothie is flashed on your smoothieboard, and your computer is ready to talk to it. Plug smoothieboard in using the USB-mini cable. You will see a USB mass-storage device ( much like USB flash drives ) pop up : it shows you the contents of the microSD card. You can use it at anytime to access/modify files, drop gcode files in etc. 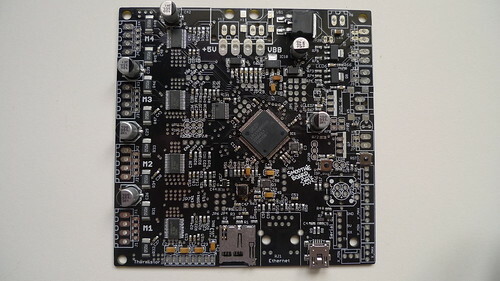 Now you will want to install a serial terminal program to talk to your smoothieboard. Cutecom is pretty nice for Linux, FreeBSD and Mac OS X. You can also simply use Pronterface if you want a more "control-oriented" interface and start printing right away. Once the serial terminal is up and running resetting the board should display smoothie ok in the terminal. play /sd/file.g -q plays the gcode file indicated. The -q option is optional an makes the play silent. G1 X10 F100 moves the robot 10 millimeters in the X axis, at 100mm/minute.